Eye Candy Friday | Mosaic and Lace. …and happy Friday! I’ve shared a few in-progress phone photos here already, but the finished project deserved the big camera (with the 50mm lens) and an Eye Candy post. This shawl was fun to knit – even the picot bind-off, which went surprisingly quick (I finished it before Federer won his second set on Sunday) – and the results are stunning. Beatiful!! I love your color combo. Have a wonderful weekend, Mary! I thought it looked quite nice unblocked, but you're right, the finished project is stunning! Georgia Tech is sure to win when you wear that lovely shawl! How lovely, hope you enjoy wearing it! Have a great weekend! I love it! And the color choice is perfect too. I'm working on Seychelles. I bought the yarn and beads four years ago, was intimidated by the pattern, and left it in time out. Now I'm working on it and finding that it's pretty easy—nice to know my skills get better over time. Be still my heart! 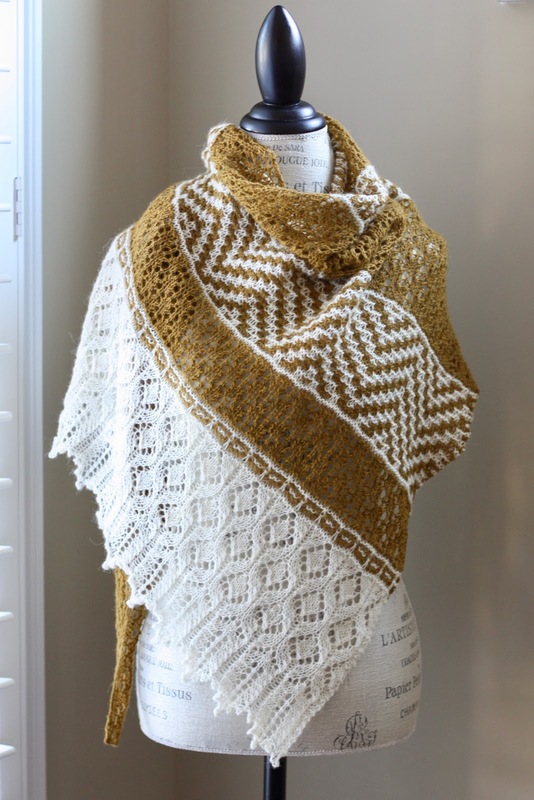 The shawl is absolutely lovely! Swoon! Swoon! Look forward to seeing you wearing it…in grand health! Your shawl is truly lovely! I've decided to keep going on mine, albeit slowly. Love your color choice. The lace section is a nice compliment to the mosaic! I have shawl envy and maybe I drooled a bit on the mac. maybe! Love the lace and the colors! !